The CUNY Academic Commons Team is proud to announce our Fall 2017 release, version 1.12. The release has a number of enhancements that make the platform easier to use, but we would especially like to draw your attention to a few highlights. For a complete list of the changes included in the new version, see the 1.12 post on the developers’ blog. 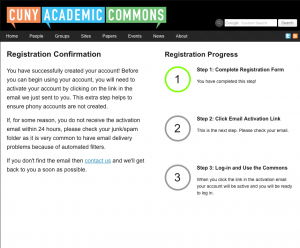 Because we want CUNY community members to be able to take advantage of the Commons, we have streamlined the signup process, with far less information required to get started. New members can upload an avatar when registering and get clear, step-by-step guidance while moving through the process. For more details on the new registration process, please see our Help Page on the subject. Many of our users rely on the Reply-by-Email feature to participate in Group Forum Discussions without the need to login to the Commons, so we continue to improve this capability. Until now, if you wanted to include a document or file with your post to a group forum, you were required to login to the Commons and navigate to the Group Forum. We have now expanded Reply-by-Email so that any documents attached to your email reply are automatically added to the post. In case you missed it, our last release made it possible for groups to customize their reply-to addresses, making posting to a group forum as easy as posting to a listserv. Find out more here. For those who love cuny.is quick links, they are now automatically created when you start a Group. The links can be customized by the Group Administrator and help provide the group with a memorable identity simply by using the Group’s short URL. Common Sites store and retrieve images in the Media Library. Due to performance enhancements, your images will now upload much more quickly, so enriching your content with pictures, charts and tables is now much less of a chore.